"Restu Anggraini in her instagram mentioned that The Rationalist SS 2016 is inspired by The Golden Ratio, which originally based on The Fibonacci numbers. The Golden ratio is a product of a natural principle related to the laws of equilibrium, and also well known aesthetic perfection. The Golden Ratio which appears in the sleeves, collar, front panels, details, necktie, and even in waistline measurement on this collection will express ETU efforts in creating the beautiful and timeless designs with uncompromised quality. ETUofficial introduces The Golden Ratio construction into her basic garments and asymetric outer through its new pinching and origami petal geometric techniques. ETU drew inspiration from menswear's sartorial silhouttes and cuttings, and combined it with The Golden Ratio proportion"
They picked navy, coral, white, and grey to translate the versatility of genderless piece of clothes. 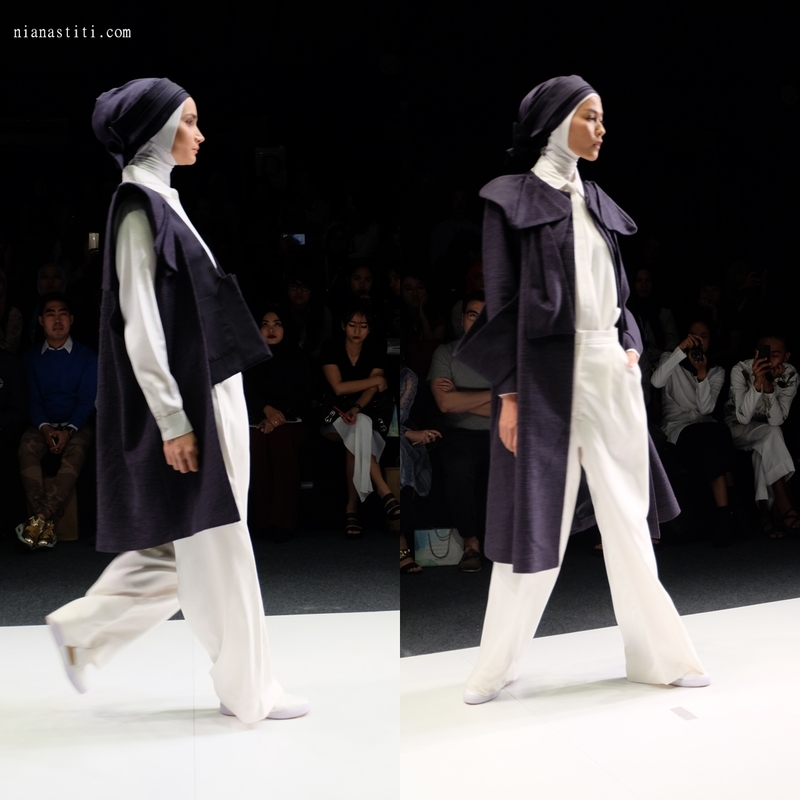 I adore how Kak Etu engange each of the collection with the golden ratio detail. 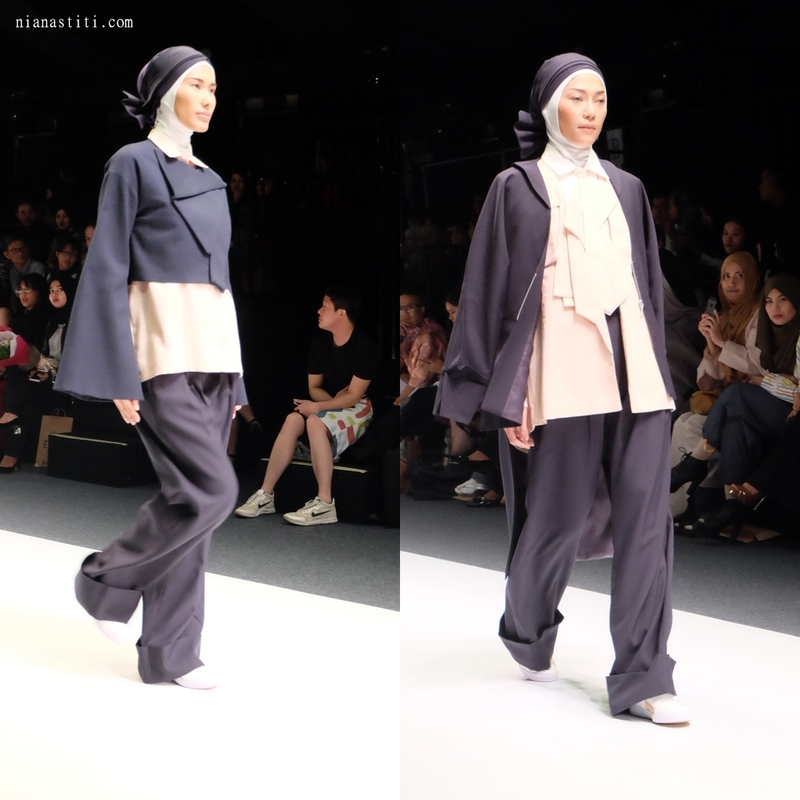 The easiest way to see the pinching origami detail is at the hijab/ head peice of the models. Japanese sailor uniform typical become a statement on the back of the outer. Everyone I knew who watch the show said that they really love the collections and really want to have it in their wardrobe. 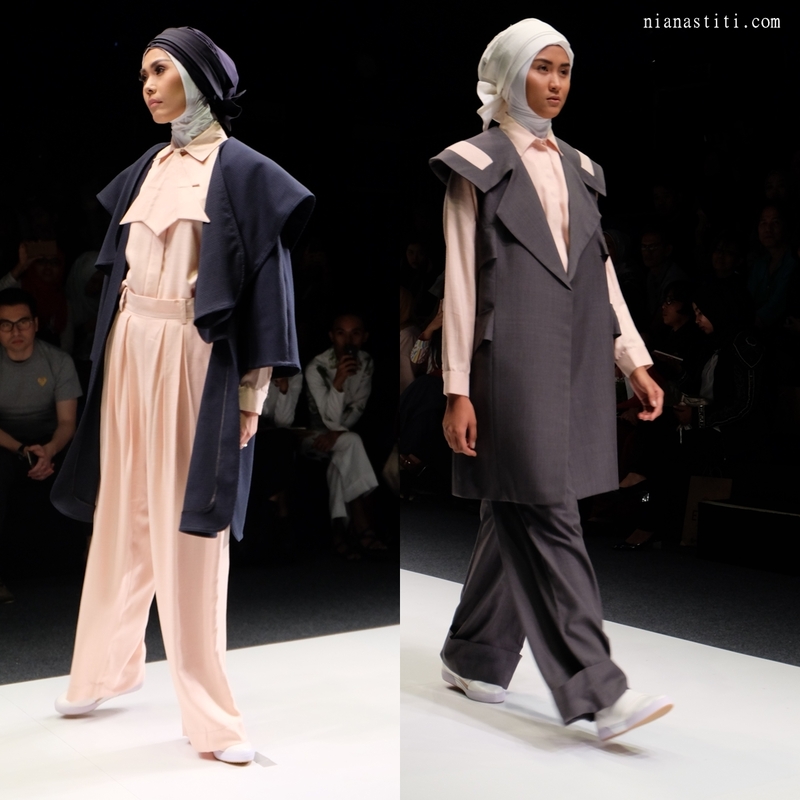 I already visited ETU's booth at The Hall Senayan City 8th floor to check out the collection's detail. Every cutting and detail are truely representated at the caption from Kak Etu's team mentioned above. It is in very high quality condition. I like the wool fabric's texture. Unfortunately, the price wasn't available yet. But we can leave our email adress or name card to be contacted soon by their team. 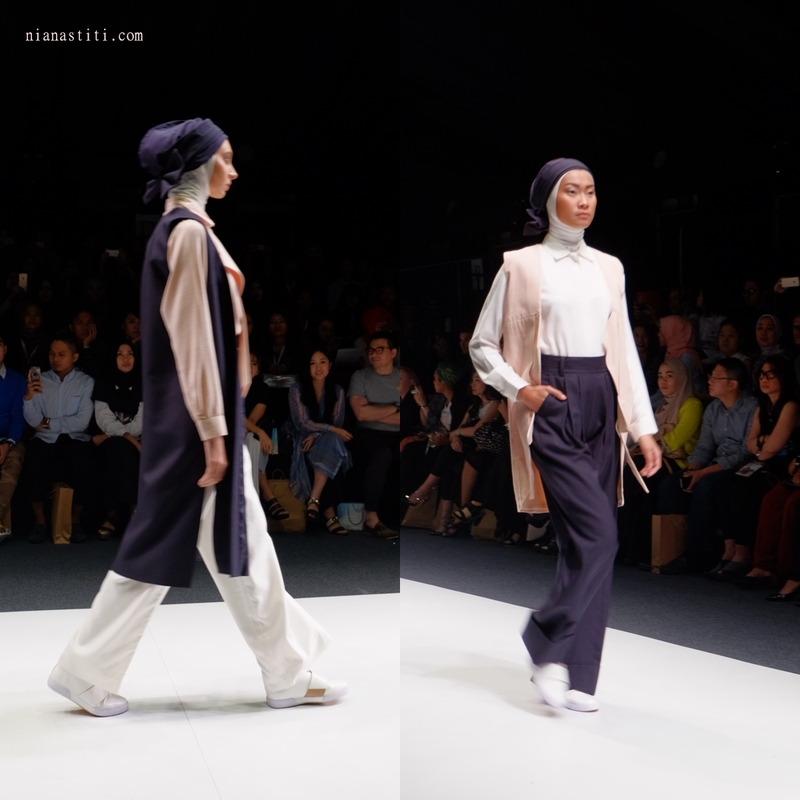 Eventhough her collection recently dominated by office wear and still have the similar cutting with her Marcedes Benz Collection, but I could see how she grows, being bolder and giving more detail in the current collections, The Rationalist. I prefer the colors pallete in this collection than before. Bold but still fresh with white and pink. I think Kak Etu will make us more adore her design at the upcoming Virgin Melbourne Fashion Festival 2016 as she won Australia Indonesia Young Fashion Designer Award 2015. Wuiih. Keren-keren desain bajunya. Adem lihatnya.